We provide Laboratory Electric Bunsen which is used for heating test tubes, small flasks,beakers etc. It is very safe and can be carried anywhere to connect to the power source. Our Electric Bunsen does not require the gas and hence does not cause any type of fire hazards and smoke. Complying with International standards, our Electric Bunsen produces radiant heat and keeps atmosphere clean and is ECO friendly. Light weight 1 kg only. Very Useful for heating Test Tubes,Crucibles, Small flasks, Beakers, etc.The heating element is Spiralled Nichrome wire enclosed in refractory casing. 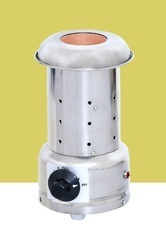 Very safe compared to conventional bunsen burner.Can be carried anywhere and connected to the power source.No fire hazards since it gives no flame.Works on electricity, no gas required.Produces radiant heat. Looking for Electric Bunsen Burner ?